I remember Zammo and the cast of Grange Hill (British TV series set in secondary school) singing ‘Just say No’, and Nancy Reagan’s unforgettable one liner (which I like to think she may have stolen and customised from Grange Hill’s slogan) – ‘Say no to drugs and alcohol’. That was in the mid 1980s when teachers were warned to be alert to hard drug users by looking out for kids who weren’t showing interest in lessons, or who displayed symptoms of having a cold. I for one got into a lot of trouble on that basis. It’s not that heroin was a new drug or a new problem. It’s that the media had become aware that heroin use wasn’t just for some special junkie elite - anyone could get it. Kids could get it. It was a sensation. The stuff headlines are made out of. By the time the film Trainspotting came out in 1995, we were all only too aware of heroin. But despite knowing several users, the real problem still seemed to be else where – in Edinburgh or London. Now in 2002, even in Derby, heroin is normal. ‘And the reasons? There are no reasons’ as Ewan McGregor’s character in Trainspotting (Renton) told us. There are of course many reasons for heroin; most so complicated and intertwined that it seems pointless to look at them unless one is a drugs psychologist. And any one can read about what heroin is like, or how dangerous it is, and all sorts of people are willing to conjecture why people do it. But what’s going on with heroin in Derby? And what do people do about it? Modern heroin use started in this country in the late 1960s when the prescription of heroin by doctors was made illegal. The market (a few hundred users) was flooded with powdered heroin distributed by organised criminals in London’s west end. Users were no longer registered, or under the careful guidance of a doctor. Anyone with the inclination could buy it, and heroin use exploded. Various social changes and trends have come with fluctuations in usage, but in general the rise has been steady and continuous. “It’s going alright for you tonight.” I suggested to a man begging on the street after I watched two people give him change within the space of a few seconds. “No it’s not. It’s not alright at all.” He replied with a seriousness that made me ashamed. He’s 33 years old and he’s been doing heroin for 11. He looks ill and has sores on his face. He told me that he’s homeless, 1 of about 14 that he knows in Derby. “Will heroin kill you?” I asked. “Yes,” he said, “unless I get help. I just want help to get off it – heroin.” I asked him if he’d been to Addaction (an addiction treatment agency). He said that he had been, but there was a 9 month waiting list to get the treatment he wanted – a drug that gets rid of the physical symptoms of the addiction straight away (whose name he couldn’t remember). I asked him if he used the needle exchange. He said sometimes, but didn’t look very enthusiastic. He has a £400 a week habit. He funds it by begging and selling the Big Issue. “I don’t ever steal though.” It was the only thing he told me with pride. I asked him what message he would like to give to someone who had tried heroin a few times. “Get away from it.” he said, “take any way out you can.” He’s on the waiting list for his treatment, but he thinks he might be dead by the time it comes. I think he might be right. I also talked to a woman begging on a different street. She’s 28 and uses £30 worth of heroin a day (that’s £210 a week). She’s been doing it on and off for 4 years. She’s homeless as well. “You’re not trying very hard at begging.” I observed. “No,” she said. “I’m scared of getting arrested again – I got arrested 4 times last month. They didn’t charge me. They just want something to do.” She told me that fear of being arrested had forced her to cut down her heroin use. She’d only done £10 worth that day, but it was still early evening. She’s been going to Addaction for a week and a half, though she’ll have to wait a year for her treatment. She’s hoping for a two year residential detox program. The waiting list’s longer for that. There’s no waiting list for the counselling though, and she told me that she goes. “They help you choose the best way for you.” She said, but added, “It’s not right that it takes so long to get help.” I suggested that they didn’t keep people waiting on purpose. They probably can’t get the funding they need to help everyone straight away. “I suppose it’s our fault for being on it in the first place.” She said. “I suppose so,” I agreed, but that doesn’t explain why so many people do it. There have never been more users than there are now. But it’s not just homeless junkies who use heroin. Many people have homes and families, many have jobs. Some people have used it a few times and then stopped, or just use it occasionally. I found some people that smoke it now and then after a club. “People just do it to chill out,” one said. I asked some one who had been in prison if he’d done any heroin. “Of course.” he answered. He explained to me that you get a Kit Kat wrapper and put the powder on and hold a lighter underneath and then inhale the vapours through a tube. I asked how much it cost, and he said, “I don’t know, 20 mars bars?” I was unable to decide whether or not that was a joke. He explained that people put tiny quantities under a postage stamp, it’s called ‘a beetle’, or visitors bring it in under their foreskins or up their arses. “Most things you can smoke in prison have been up someone’s arse at some point or other.” He told me. Addaction is a national agency for the treatment of drug and alcohol abuse. It’s been operating in Derby since April 2000. It offers a wide range of help, advice and treatment for users and support for families. Treatments range from long term detox programs for lower level users, and substitute prescriptions of methadone for more severe cases. Also on offer are group work, counselling, training and career help, a needle exchange, advice on safety when injecting, and acupuncture. People who use the service are often referred by doctors, or as a condition of probation, but most come of their own accord seeking help. Most of Addaction’s work is with heroin users. Between 1st of July and 30th September of this year they dealt with 369 heroin cases as opposed to 156 for alcohol and 14 for crack and cocaine. Colleen Pratt, project manager at the Derby branch, estimates that this is just the tip of the iceberg. “There’s a lot of people out there we’re not reaching” she said. Women with babies fear they risk being separated from their children and often won’t seek help. For many black and minority people the stigma attached to drug use makes trying to get treatment almost impossible. 75% of people using Addaction’s services are male. Most are white and in their 20s. The cost of people’s habits can vary greatly from £10 a day, £70 or even £80 a day is a lot, but there are reported cases of people using as much as £200 a day. Most people’s first experience with heroin is smoking it. As the addiction gets stronger and tolerance develops, injecting simply represents better value for money. You get a stronger effect from it. Heroin users are prone to taking overdoses. 1 third of these are thought to be deliberate – long term drug use causes depression. But anyone who has stopped for a while will find that their tolerance is greatly reduced. Taking the ‘usual’ dose after giving up is often enough to cause death as is mis-calculating purity. Heroin is cut with all sorts of things from powdered milk to paracetamol, or even brick dust. You can never gauge accurately how strong a bag might be. I asked Colleen Pratt if there was any hope. “Oh yes,” she said, and explained that expectation for improvement was modest but realistic – users reducing their doses, getting a job, or keeping one, or just starting to inject safely. These are all positives. Even while you haven’t got rid of the addiction there are still many good things that you can aim for and achieve along the way. An important message for Addaction to get across is that no matter how bad things get there is help. People should know that they are welcome to come at any time without appointment. On a more practical level they are trying to encourage people to smoke rather than injecting. Smoking isn’t any less addictive but simply causes far less damage to the body. Addaction launched a youth project in August. It operates from host sites like The Space and Connections where young people can go and get help and advice. Since its launch they have had 61 cases to do with heroin. There are still many new users arriving. Steve Holmes is project manager for Derbyshire Drug Market Project and was a drug squad officer in Derby for 12 years before that. The Drug Market project is involved in the prevention of drug distribution. He believes that the heroin problem has risen over the last 5 years, but, unlike Addaction, he thinks that the problem may be starting to stabilise. Because of the vast number of recent arrests in the county for supply, it is harder than ever to get heroin, people are suspicious that new users may be undercover police. In the last year there has been an average of nearly one arrest per day of Gangs from most Derbyshire towns. With fewer dealers about now is a great time for rehabilitation. None the less it’s harder to get arrests for heroin than for other drugs. Dealers are very careful, often using couriers and only carrying small quantities in the mouth that can be swallowed should there be any trouble. Most people who use hard drugs will at some stage be approached to be a courier although often dealers prefer users of other drugs to heroin as they tend to be more reliable. Couriers are treated as suppliers by the law. Mobile phones have made it even easier for dealers to have only the amount they are going to sell on them. 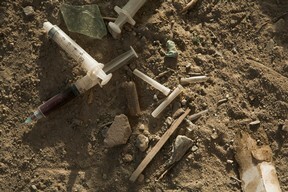 Sentences for the supply of heroin start at around four years. Even should someone be caught with drugs for personal use and just given a caution, it will still be on the record 10 years later which can be a problem when applying for jobs where police checking is necessary. The rising problem for Steve Holmes is crack, and it’s hard to judge just how big that is, but it seems to go hand in hand with the rise in street robbery. Although there is much crime in connection with heroin most is less serious and tends to be theft from friends and family, or shop lifting. “Heroin is a lazy drug,” said Steve Holmes. Addicts rarely have the inclination to commit more serious crime. When I asked Steve what message he would like to get across he told me that the biggest lie that people are told with regards to heroin is that they won’t get addicted if they just smoke it. Smoking is just as addictive as injecting. Steve Holmes didn’t want to explain their methods exactly, but said that the police are working hard to prevent drug distribution, but that the problem was still enormous, in Derbyshire as everywhere. So whether you’re Zammo, or Nancy Reagan; in the business of prevention of drug use, or the treatment of drug use; whether you’re on the street begging to support you problem, or high flying to fund a £200 a day habit; most people agree that heroin use is a terrible tragedy. For most it leads to a severe addiction that ruins lives. There are some who use it occasionally who don’t view it with such fear, but even they are wary of becoming addicted. This may be an enormous social problem, or a whole series of individual psychological ones, but the point which people over look is that people are going to continue to take heroin because it feels nice – at least when you first start. It’s a good buzz, it’s very more-ish. Should you need help or advice please contact Addaction on 01332 370400. Or call in at Becket Street, Derby. All clients are treated in complete confidentiality.